› Fifty-one works by thirty-four students were selected for this year's Student Juried Show. Fifty-one works by thirty-four students were selected for this year's Student Juried Show. We are pleased to present this annual exhibition open to all USM students submitting work in any media. The exhibition is designed to provide students with an introduction to a professional type of exhibition as emerging artists. As part of the process, they obtain feedback from art professionals in the community, learn to prepare art for a professional setting, and have their work exposed to a wide range of viewers perhaps for the first time. Our appreciation to jurors Nat May, curator and former SPACE executive director, and Anne Alexander, sculptor and educator. They chose fifty-one works by thirty-four students, then selected award winners for cash and gift certificate prizes. Best of Show: Mark Ford for Rift 1, 2 & 3 - three collages from book scraps. Juror's Award: Kate Heiman for Tango, a mixed media sculpture. Katherine Murray for Bloodlines and Tea Set, mixed media 2-D and 3-D pieces. Zac Adams, Finding Home, a ceramic wall relief. Art Discipline Awards were also presented at the Opening Reception. The discipline awards acknowledge the accomplishments of art majors within the disciplines offered by the Art Department. Recipients are nominated by faculty who teach within the disciplines. Each year we look forward to celebrating the work of outstanding students, including those who were selected for the annual Student Juried Exhibition. 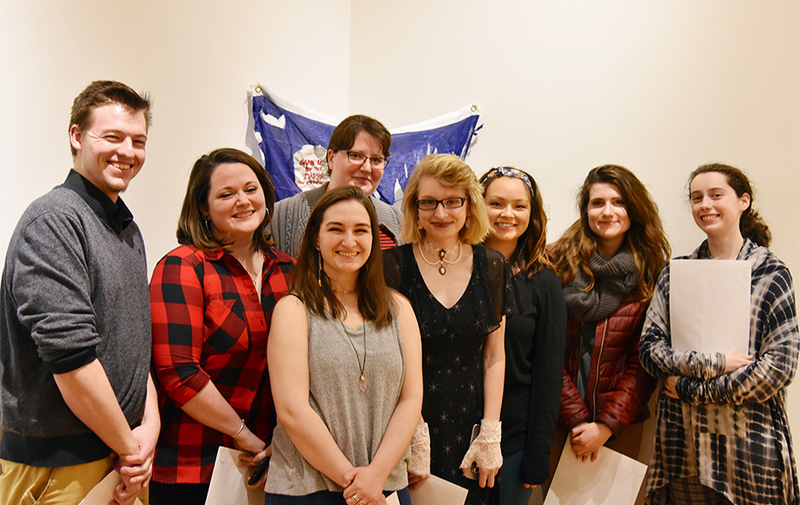 Art Discipline Award Winners shown below, in order, left to right: The Exhibition runs from March 8 - April 1 at the USM Art Gallery in Gorham. A smaller version of this show will be displayed at the USM AREA Gallery, Woodbry Campus Center, Portland campus April 5 - May 1.